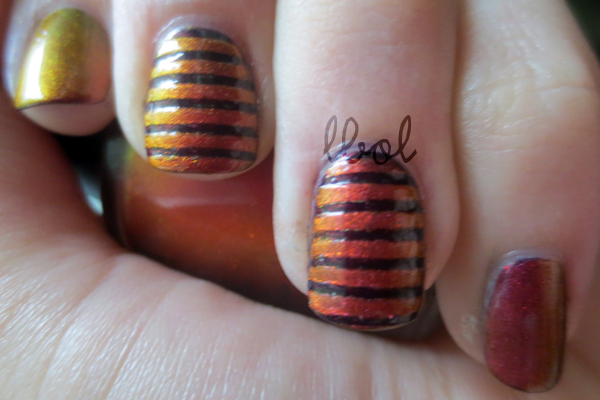 I can't get enough of this multichrome OPI gloriousness (spell check seriously thinks I'm illiterate for the record). 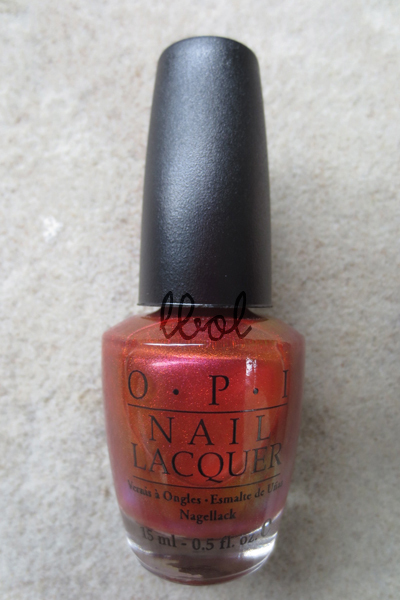 I'm a total OPI fangirl and I'm not ashamed to admit it. So, about this polish: Man of La Mancha is also from the Holiday on Broadway Collection. I looked at a thousand swatches of La Boheme (a lemming for me for a while) but after swatching this and Movin' Out I don't think I even need it anymore is how righteous this polish is. 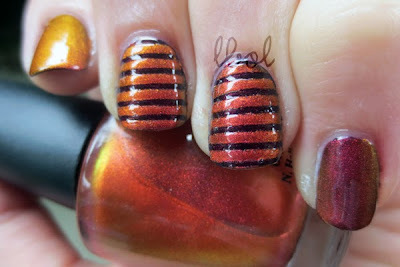 The swatches are 2 coats of Man of La Mancha over German-icure by OPI (which is freaking awesome also), topped with SV. 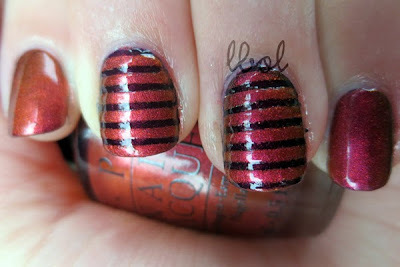 One coat made for a nice, sheer, sparkling red-orange topper to the rich shimmery burgundy of German-icure. And I know chromes over black make for the best, you know, color shifts, but I wanted to mess around with the deep red tones of La Mancha. I'll have to try it over black too, as I don't know if it made a difference or not (but I dig the contrast on the accent nails and I much prefer German-icure to straight black). I also wanted the full impact of La Mancha, so I went for the second coat. Instant nail polish obsession time. This one has red/orange scatterd microglitter in it too, cuz it's not already amazing. Application was great, or whatever, and I just realized that I didn't lay down a base coat. Bummer. I'll be chipping the crap out of this in no time! You're amazing. Hey, how's it going, even? Man. I'm so lame lately.